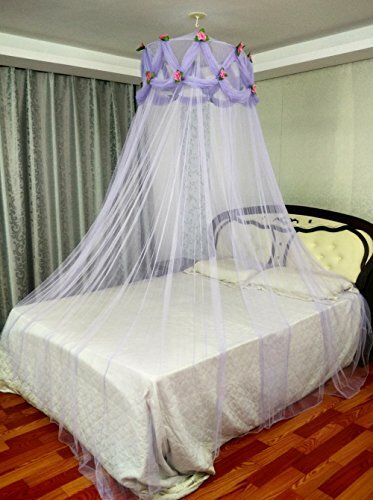 100% Polyester Brand New Full Size Violet Priness Bed Canopy this Canopy is Huge.Measures 27'' at the Hoop to over 8'' down. Circumference (cm) 1250 Height (cm) 250 Diameter top (cm) 65. this item is Perfect for any Child Room. its Great for Spring and Summertime Fun the Color is Violet with Lace and Accents as shown - Would Look Great in Child, Teen, Adult or Baby Room, Fits all Size Beds from Twin to King would fit over a Crib use it Backyard or use it in Corner of a Room with Pillows for a Great Accent Area. If you have any questions about this product by Ka bed canopy net, contact us by completing and submitting the form below. If you are looking for a specif part number, please include it with your message.